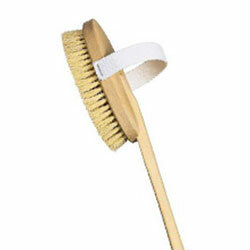 If I could only choose one body-improving trick to impart, then it would have to be, without a doubt, Body Brushing. I have been body brushing for over ten years; I started it way before I had even considered being a model, and I have done it ever since. I totally believe in it; it improves the circulation and is a little bit of a workout in itself! You need to spend a few minutes doing this every day – that’s all! Do it when you’re waiting for the shower to heat up, or the bath to run, or your Veet to take effect, or your face mask to work! Apart from the initial outlay (a brush! ), it’s free. Can anti-cellulite treatments GET any better than this? I shall now tell you how I know this works: I stopped brushing for a year or so, when I was first modelling and a bit ‘woo-hoo!’ excitable. Body brushing was the last thing on my mind! But bloody hell, did my thighs go dimply! Back to religiously brushing, and the dimples disappeared. I’m not exaggerating about this! It’s all in the stimulation of the skin, flushing out toxins, getting sluggish circulation on the move. Watch my video for a demonstration of the ultimate cellulite killer! Next Post The Great Follower Giveaway: Results!